Gearing up for the release of Rangers of Shadow Deep (hopefully a matter of days), I have painted up a couple more warriors of Alladore. I don’t need these guys for my ranger’s companions, but there are a couple of scenarios where you essentially have allies. Plus, I just wanted to finish off my first sprue of Oathmark humans. Sometimes, it is nice to paint understated fantasy figures, wearing simple armour without too may accoutrements or detail. 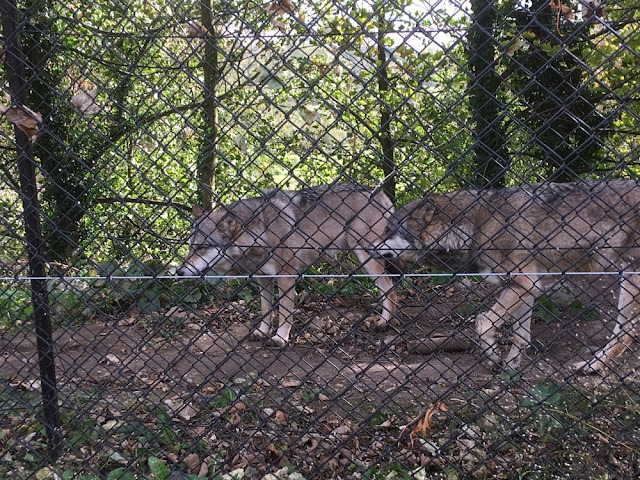 A couple of weeks ago, I went back to Oxford for Osprey Publishing's 50th anniversary party. The company has been such a major part of my life over the last decade-plus, that I didn't want to miss it. I arrived in Oxford in the morning. 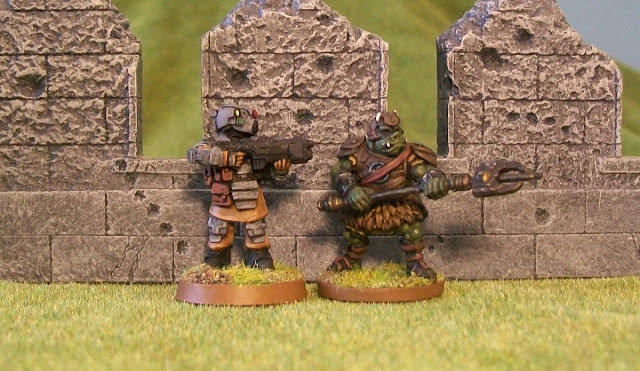 This gave me the chance to meet up with Phil Smith (Head of Osprey Games), Nick Eyre (owner of North Star Military Figures) and Dan Falconbridge (owner/editor of Wargames Illustrated). We had a drink in the Eagle & Child, lunch at another pub, and the went over to the Bodleian Library for their temporary Tolkien exhibit. It’s was a great little exhibit, especially for the cost (free). The highlights were seeing a few pages of Tolkien’s scrawled Middle-earth writings, lots of his original artworks, and, of course, his recently discovered annotated map of Middle-earth. The exhibit has now closed, but considering its popularity, I suspect it will be back. At the party that evening, I got to catch-up with lots of old friends, Osprey colleagues both past and present. I also chatted with some of the authors and illustrators that have helped make Osprey great. Most notably, I got to speak to two artists that I’ve had the chance to work with closely in the past. I had a long chat with Mark Stacey who illustrated the Steampunk Soldiers and Steampunk Soldiers: The American Frontier books that I wrote with Phil Smith. I also got the chance to speak with my old buddy, Peter Dennis. I’ve worked with Peter Dennis on a lot of projects, including my books Dragonslayers and The Story of Santa Claus. Several years ago, when I was the commissioning editor for Osprey’s Myths and Legend series, I commissioned Peter to illustrate the book we were doing on Robin Hood. 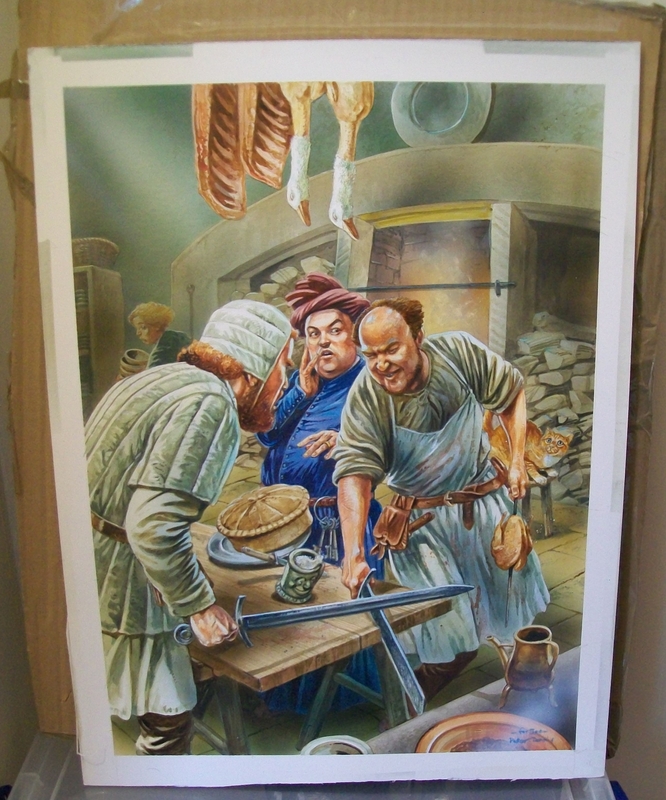 In one of the stories, Little John infiltrates Nottingham castle and ends up in a fight with the cook and a porter. When Peter came to illustrate the piece, I discovered that I had been cast in the role of the cook and that Phil Smith had become the porter. Little John seems to be played by Peter himself! It’s not the most flattering depiction of either Phil or myself, but it is all the more wonderful for that. A few days after the party, I received a package from Peter containing the original artwork! (It's not the first time I've seen Peter's generous nature.) There is not a lot of open wall space in my little office to hang paintings, but something else is going to have to give way! (Especially since my wife has already made it clear that it will not be going up in the lounge – for reasons not clearly expressed). Thanks Peter. It’s a great memory of a fun time. I hope that we have the chance to work together again some day! If the title of this blog has any meaning to you, then you are at least a level 2 Star Wars geek. For example, my sisters are both level 1. They have seen all of the movies, know all of the main characters, and are ready and willing to jump into a debate about the Force or if Han fired first. However, their knowledge, and their interest, ends with the movies. Unlike them, my interest in the Star Wars universe has, at times, branched out into the books, comic books, games, cartoons, etc. Through this, I have gained a lot more knowledge of the universe, including a lot of ‘race names’. I’m still far from an expert, but I can tell my Weequays from my Trandoshans. For those that don’t know – Weequays appear in Return of the Jedi, most notably in the Sarlacc’s Pit sequence. They are the prune-faced guys with dreadlocks and heavy looking halberds that are apparently tasked with pushing prisoners off of the plank. As we all know, it doesn’t end well for these Weequays. I got four plastic Weequays in the Jabba’sRealm expansion for Star Wars: Imperial Assault and just finished painting up my first one. 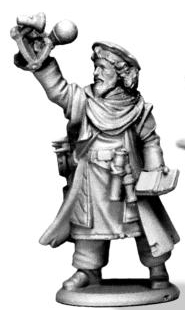 Once again, the figure is excellently sculpted and cast. Even in somewhat bendy plastic, it was a joy to paint. I went with a muted paint scheme as befits a desert-waste pirate, methinks. I’ve got three more of these guys, and while I like the pose, I’m thinking I might try converting some of the others. I’d like at least one to be holding a pistol (as one does very briefly before Luke chucks him in the pit). Not sure if I’ve got the bits I need, but I’ll see what I can do. Having finished this guy – I’m struck by the resemblance between him and the Klingons as showed in Star Trek: Discovery. This is another companion for my ranger in Rangers of Shadow Deep. Conjurors are great utility companions. Before every scenario, they get to pick 2 or 3 spells – unlike rangers who know certain spells, but cannot change them. The only problem, once they’ve cast their spells, they are very weak fighters, so use those spells wisely! 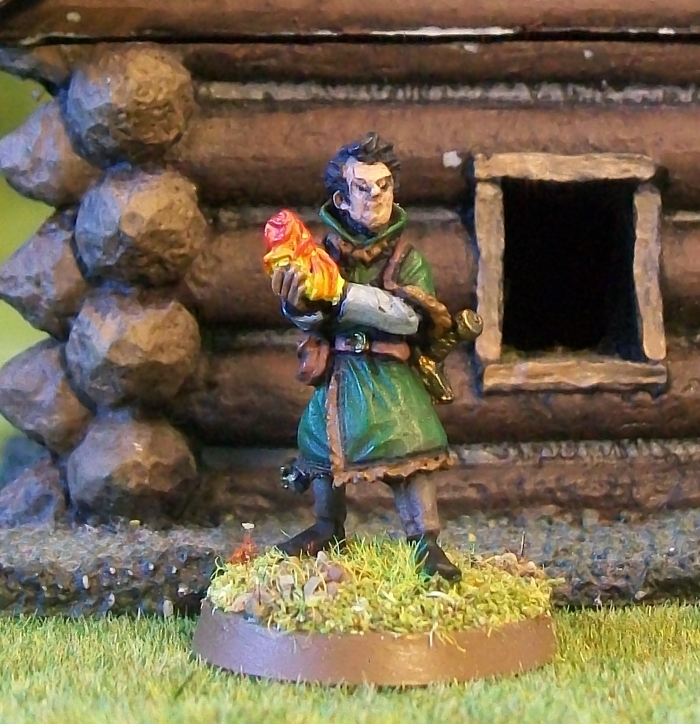 The figure is actually the Elementalist apprentice from the Frostgrave line. 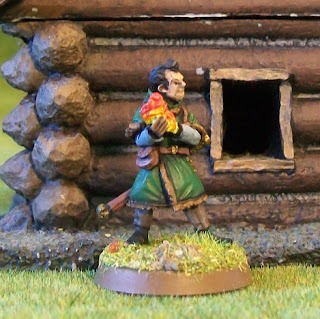 I painted him in the same green that I’m using for all of my ranger’s companions/soldiers of Alladore. I was a bit worried that he might look too ‘cold weather’ to fit in the with the rest of the band, but I don’t think that is the case. My favourite bit about this figure is that he basically only has one hand. The other is Just a little ball of flame – perfect for someone about to throw a fireball! (And yes, you can take fireball in Rangers). Otherwise, though, he doesn't look terribly 'wizardly'. I am quite pleased with my ‘fire effect’, which is just yellow layered up to red. Just need to paint up a dog and my ranger’s initial companion set is complete! 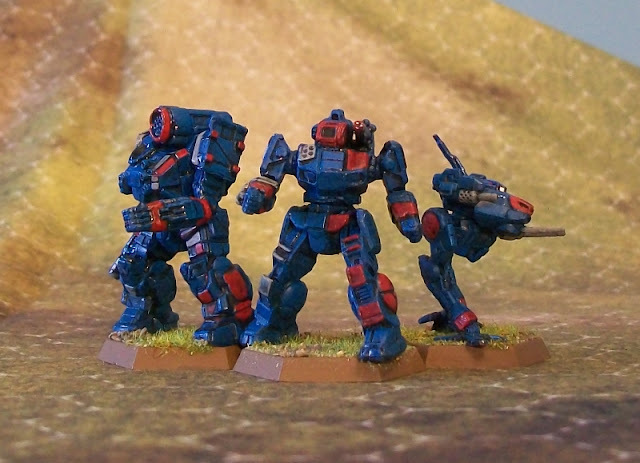 I have just finish painting my third mech from the new Battletech box set. This time, it’s a Shadow Hawk. This has always been one of my favourite mechs for several reasons. First ‘Shadow Hawk’ is just an awesome name. Two, the Shadow Hawk was depicted on the cover of the City Tech rulebook – the first Battletech book I actually owned. 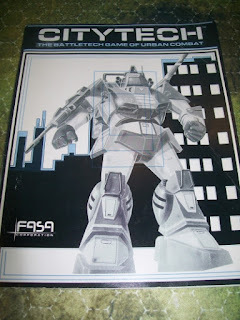 And, finally, even before I was aware of the existence of Battletech I owned a little plastic Shadow Hawk toy. It wasn’t a miniature, but came, I think, in a bag of cheap plastic robots. I think the original Shadow Hawk was based on a robot in an old anime, and I guess that little toy was based on the same thing. I have no idea what happened to that little plastic toy, but now I’ve got this shiny new little plastic toy! Like his brothers, he’s painted up in the red and blue of the Fire Hawks Legion (which makes him a Shadow Fire Hawk…which is starting to sound like a balrog). Interestingly, in the group shot above, you can see how much shinier the Thunderbolt is than the other two – a result of me still learning to use the ‘Anti-Shine Matt Varnish’. I fear I put much to thick a coat on the Thunderbolt. Oh well, I’m learning. 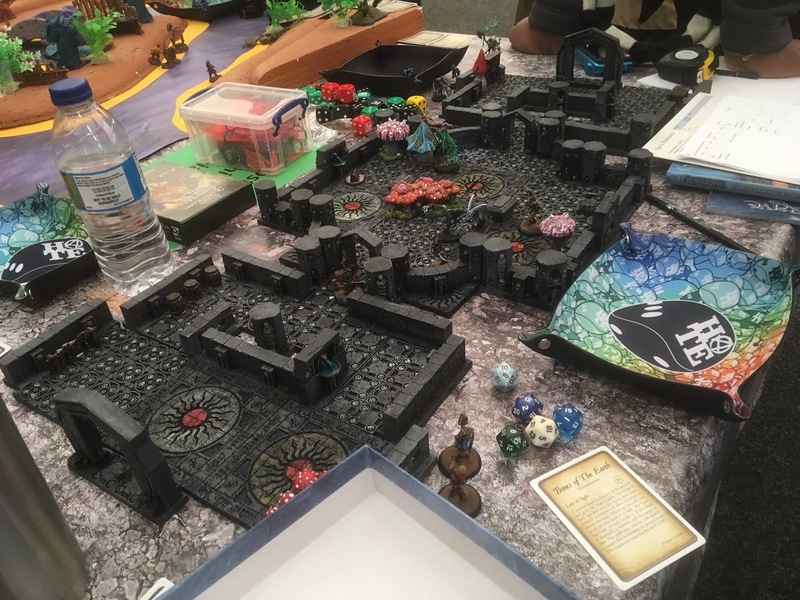 Also just visible in the photos is the new hexed battlemat I got from Cigar BoxBattles, perfect for Battletech and Ogre. I’ll be showing it off and talking a bit more about it in future posts. 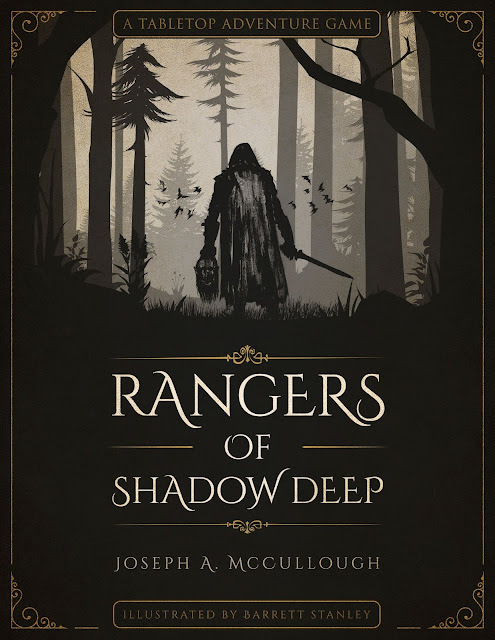 Rangers of Shadow Deep - Cover Revealed! I know a lot of people are patiently waiting for the release of Rangers of Shadow Deep, and I can report that a lot of progress has been made. In fact, we now have an official cover! Many thanks to Barrett Stanley for providing the cover art and Steve Meyer-Rassow for the graphic design! I will, of course, keep you updated! 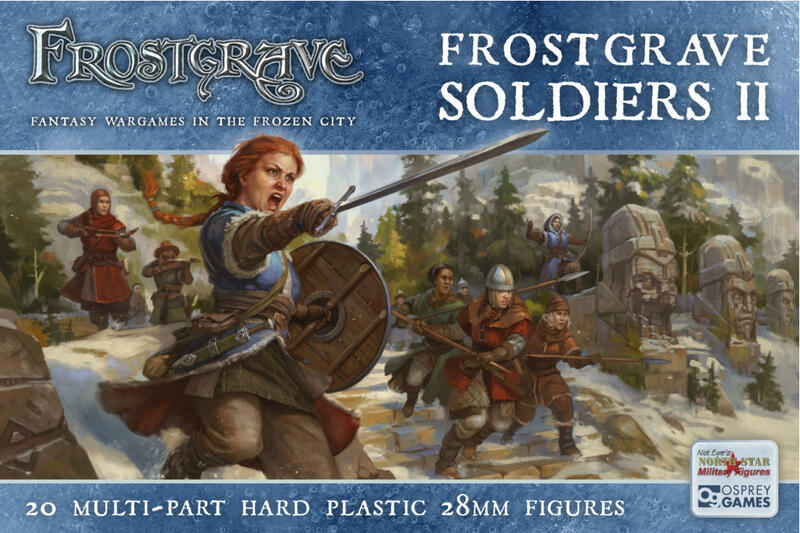 Frostgave: Maze of Malcor Miniature Pre-Order Campaign! 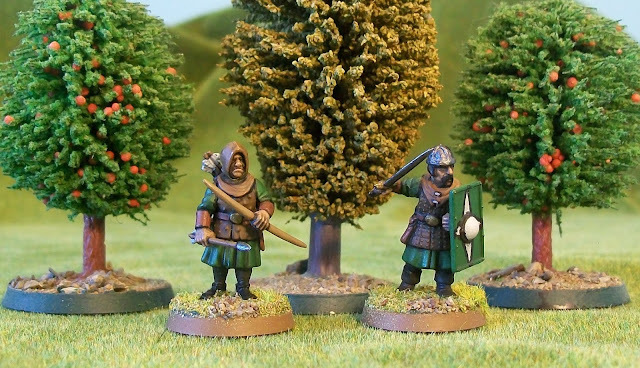 It is a big day for Frostgrave fans! 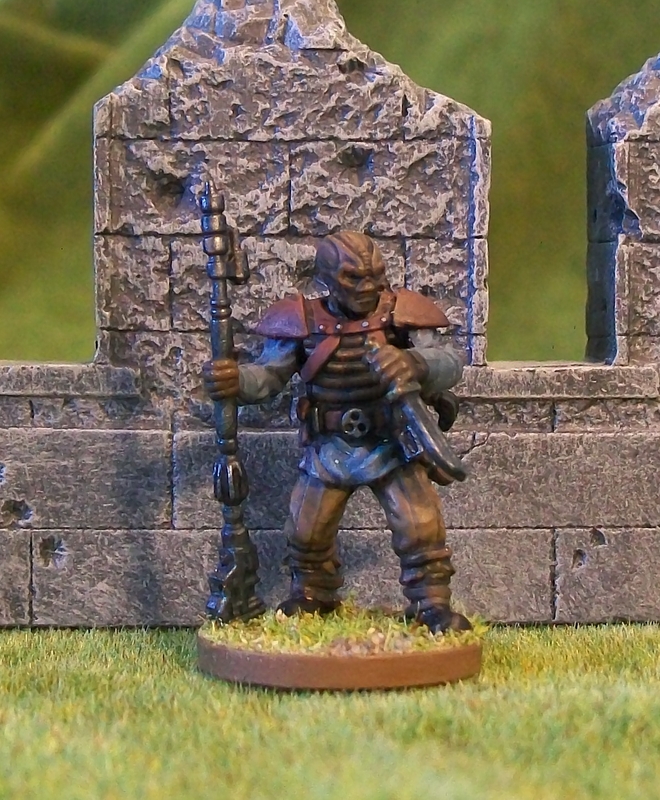 It is the start of the Maze of Malcor Miniature Pre-Order Campaign. 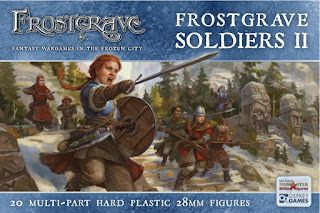 As of today, a host of new Frostgrave miniatures are available to pre-order, including five new wizards and apprentices, a dozen or so new monsters, some new specialist soldiers, and the Frostgrave Soldiers II box set. 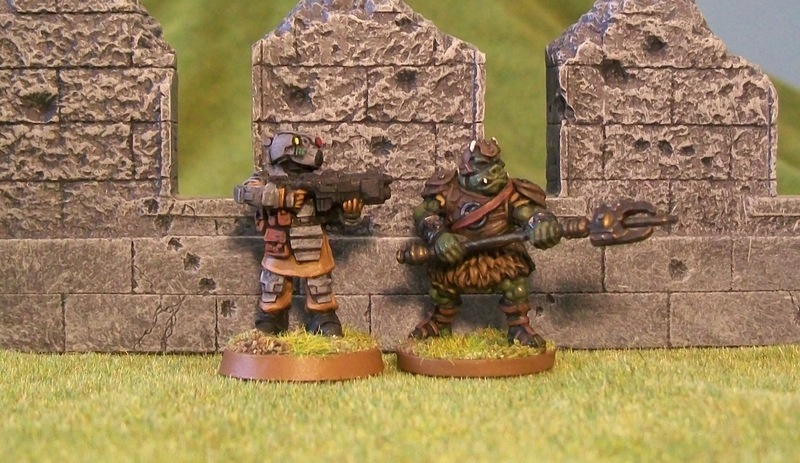 This last item, which features twenty, plastic, multi-pose female soldiers is something that me and the gang from Osprey and Northstar have wanted to produce since the game was launched. To make it all more fun and interesting, the pre-order campaign has taken a page from Kickstarter and established 'spend-goals'. Basically, as the campaign reaches certain total-order thresholds, everyone participating gets freebies. In this case, there is a chance to pick up the phantasmal 'shade' versions of each of the five new wizards. Most of the figures in the campaign are drawn from Frostgrave: The Maze of Malcor. You can also pick up the book, if you don't have it, and you'll even receive a special bonus treasure token if you do. (A really cool one, I might add). The campaign lasts for 28 days, so get your order in now. And, remember, this is not a Kickstarter; it is not crowd-funding. All of these figures are either already produced or in the final stages of production. So all of the orders should be shipped soon after the campaign ends. I'll post periodic updates for those who are interested. To see all of the new figures, and to join in the pre-order fun click here. The show was actually a bigger, more impressive affair than I expected. There were something on the order of 40 different track layouts on display, and probably 20 dealers. This is the show’s 47th annual installment, so it’s well-established, and even on Sunday it seemed well-attended. My son loved it. In fact, he liked watching the trains so much, it was often hard to get him away from one display so we could look at another. There were some impressive set-ups. My favourite was a mining scene that had several trains running, including one underground, as-well-as a kind of cable-car set-up. Strangely, my son’s favourite was the guy who was at a table fixing broken trains and running them back and forth on a very short track to see if they worked. He did have a pretty cool engine that was billowing smoke. The only drawback to the whole experience was that I had to constantly lift up the heavy little kid so he could see the trains. The show did have stools you could use, but even with these he was still a little too small. So, by the end of the show, my arms were burning. It’s hard to do any shopping while carrying a 2-year-old who wants to look at trains, but I did manage one little purchase. 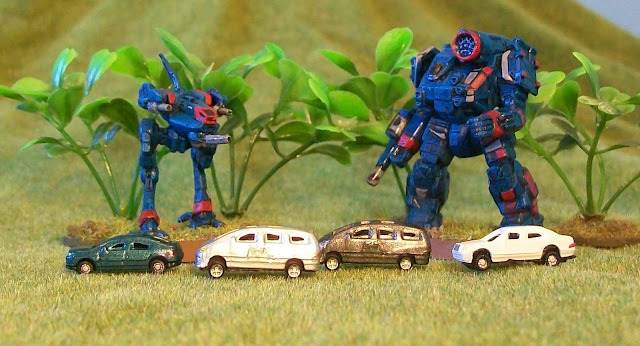 I bought some tiny cars that I thought would work with my 6mm set-up. I think they are ‘Z-scale’. In truth, they are actually too big for traditional 6mm – although a lot of 6mm is bigger than it is supposed to be these days. 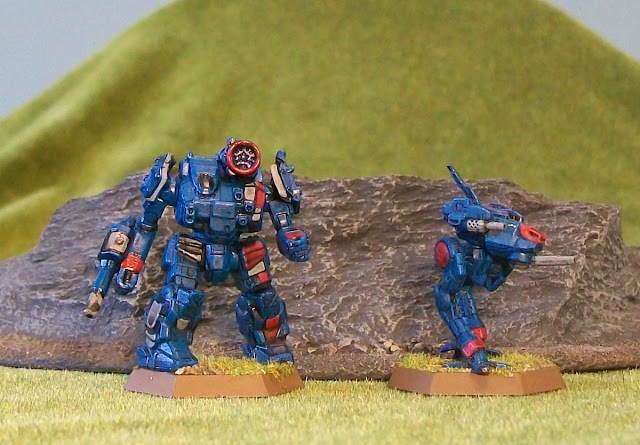 Also, when compared to my mechs, which are up on bases, they look even smaller. Anyway, they work for me. A good day, all-and-all. I suspect we’ll go again next year, if he’s still into trains, when he’ll hopefully be tall enough to use the stool. Over the last few years, I’ve been having an increasing problem with novels, at least as they relate to my favourite genres of science-fiction and fantasy. It’s not the form itself that bothers me, but the frequency with which I have encountered stories expanded to novel length that would have been better served by some shorter form. These stories just don’t have enough plot – in genres traditionally driven by plot – to fill up 300+ pages. Often you get 100 – 150 pages of really interesting story mixed in with about 200 pages of ‘filler’ – scenes that may be interesting in their own right, but don’t really advance the story. Unfortunately, this can often be very hard to recognize until you are deep into a book. That said, I do suggest wariness of any books that switch the point-of-view character a lot, especially those that switch to the POV of the villain. While this can be done effectively to tell a great story, it is also the easiest, and laziest, way to fill pages in a book without expanding the plot. It is easy enough to understand why this happens. The whole fiction publishing industry is driven by the novel. It is by far the easiest format of fiction to sell. For whatever reason, society has decided that a 300 page story is worth £9; this unfortunately leads to the natural (if erroneous) conclusion that shorter stories are only worth a proportional amount. This has had the knock-on effect that short stories, novelettes, and novellas are often not worth an author’s time. All of these forms are actually harder to sell (at professional rates), and earn the author significantly less money than a novel. Thus, authors often don’t want to ‘waste’ a good idea on a short story or novella, when they could expand it to a novel. Unfortunately, for the most part, story ideas have a natural length, and the only way to expand them is through filler. All of this was brought home to me recently as I read Of Whimsies & Noubles by Matthew Hughes. 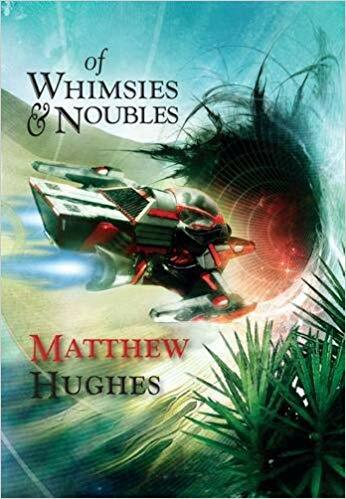 This science-fiction (maybe science-fantasy) novella clocks in at 74 pages and was published as an independent hardback by specialty publisher PS Publishing for the price of £12. It’s a terrific little story, a sci-fi crime-caper filled with interesting ideas. The main character is an overweight art-forger who likes to live the good life. He’s not an attractive character, but he is interesting. What I really love about the story is that it has no fat whatsoever – no filler at all. Every scene drives the story forward until it reaches its logical conclusion. That’s not to say the story is predictable, just that it never wanders from the main story line, and when it reaches a natural stopping point, it ends. Because of its short length, I don’t want to say much about it, but if it sounds like your kind of thing, it is definitely worth a look. Now Matthew Hughes got lucky. He found one of the few publishers willing to publish a stand-alone novella. He probably even got paid a decent amount for it. That said, I have little doubt that he could have easily expanded the idea into a novel, sold it, and gotten a much bigger paycheque compared to time worked. On the other hand, the reading public would have lost a great novella to have it replaced by a likely mediocre novel. That would have been a real shame. But now, I put forward the question: how many people are willing to pay £12 for 74 pages? The answer is – not many. That is why the book is published by the small press. I admit it, I would have a hard time paying that much for a novella unless I was a BIG fan of the author. That’s not a short at the publisher, they have to charge that kind of money if they have any hope of making a profit (Actually £12 is a really good price, usually these kinds of things are closer to £20). Seemingly anthologies would be an answer to this problem, but, strangely, these sell significantly worse than novels, possibly even worse than independently published novellas. The only answer, I suppose, is to be willing to pay for good fiction even when it is in a shorter format. The more people that do so, the larger a print run becomes, the cheaper the publisher can make the cover price. A good book is nearly always worth the price, a bad one never is. Of Whimsies & Noubles is a really good book. Return of the Jedi was first released when I was 7 or 8 years old. Thanks to the magic of terrestrial television and Betamax, I had seen the previous two Star Wars films, and absolutely loved them. I suspect my parents struggled with whether or not to take me to see the film, but, in the end, I think they deemed it important for my education. So, on one Saturday afternoon, my Dad took me to the dollar theater to catch the film before it exited theaters for good. (Remember when dollar theaters were a thing?). The opening segment of the movie absolutely terrified me. Jabba’s palace is such a creepy, evil place. The rancor was the scariest thing I had ever seen, and when it crunched into that Gamorrean Guard I think I nearly passed out. To this day, that whole sequence remains my favourite bit of Star Wars. (Although Lucas damaged it badly with the Extended Editions). In fact, if Return of the Jedi ended with the destruction of Jabba’s sail barge, I think it would still be my favourite Star Wars film. Thanks, Mom and Dad, for taking the risk of giving a kid nightmares. That little investment in my future has paid huge dividends. I am still slowly working my way through the stuff I acquired at GenCon this year, and that includes a load of Star Wars: Imperial Assault figures, most of them from the Jabba’s Realm expansion. The figures in the box are terrific. Wonderful detail, crisp casting. They are significantly better than the figures that came in the original box. 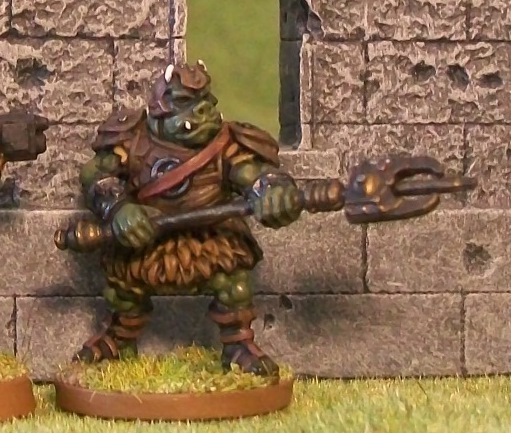 Now, in truth, I don’t play the game, but I enjoyed painting this figure a lot, and I am looking forward to trying a few more. I actually like these figures a lot better than the Star Wars: Legion figures, that are all the hotness right now, for the simple reason that they are more or less in scale with every other miniature I own. Legion figures are just too large. Standing next to a Pig Iron trooper for scale purposes. Yesterday, I mentioned that my new mech was part of my ‘Firehawks Legion’. I am using the term ‘legion’ under its definition as a combined-arms military unit. In the future I hope to add tanks, infantry, etc. For the moment though, I am concentrating on aerospace support. 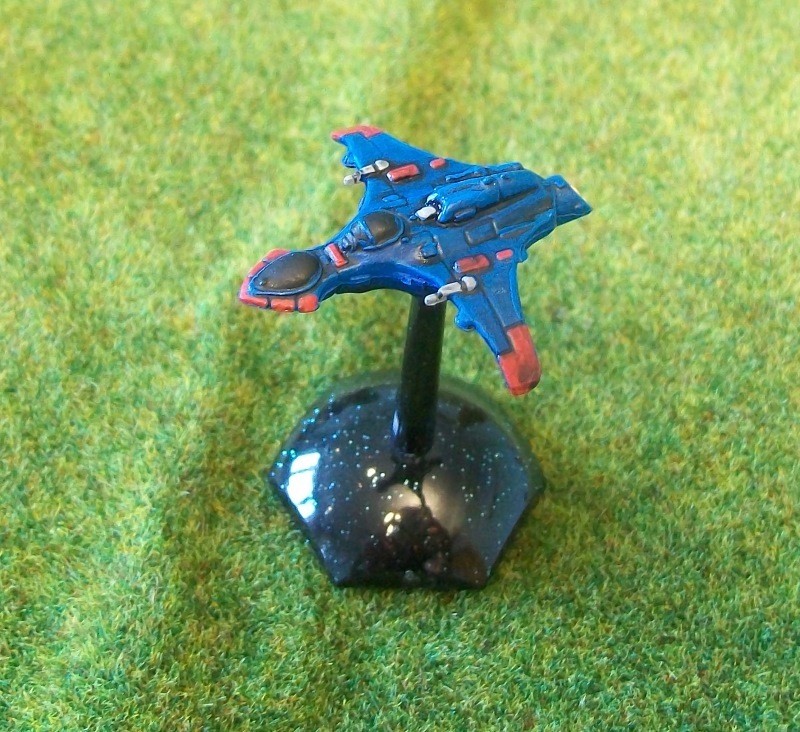 The fighter is a ‘Salamander’ miniature that was originally manufactured for Silent Death: The Next Millennium, a space-fighter game from the 80s/90s. I am a huge fan of this game, which I think has really stood the test of time, and plan to use my work on the Firehawks as the basis for painting up a bunch of fighters to play the game. I’ve even ordered a new outer space hex map from Cigar Box Battles! 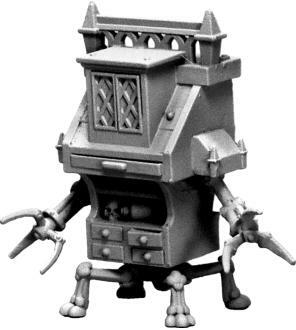 For those interested, the fighter is part of a set of twelve plastic minis that can still be obtained from EM-4 in the UK (although they are listed as out of stock at the moment) and Metal Express in the USA. It’s probably the best deal in space fighter minis around! 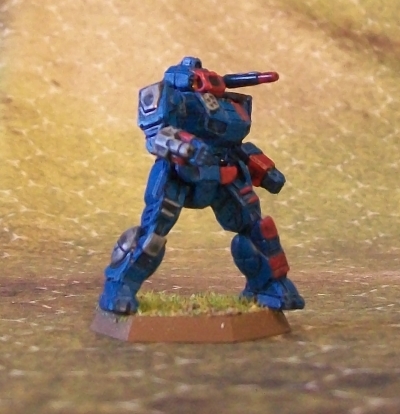 I painted this guy up in the blue and red of the Firehawks. Nothing fancy, just slap some paint on, give it a wash, a bit of dry brushing, and there you go. Easy and effective! Foolishly, I painted the figure while not on its flight stand, and got enough paint in the hole that it would no longer fit. In order to clean out the hole, I got my dremel tool and, in a fit of over-enthusiasm, managed to drill straight through the figure. I probably could have salvaged it, but decided it probably wasn’t worth the effort, considering I’ve got at least three more of them. 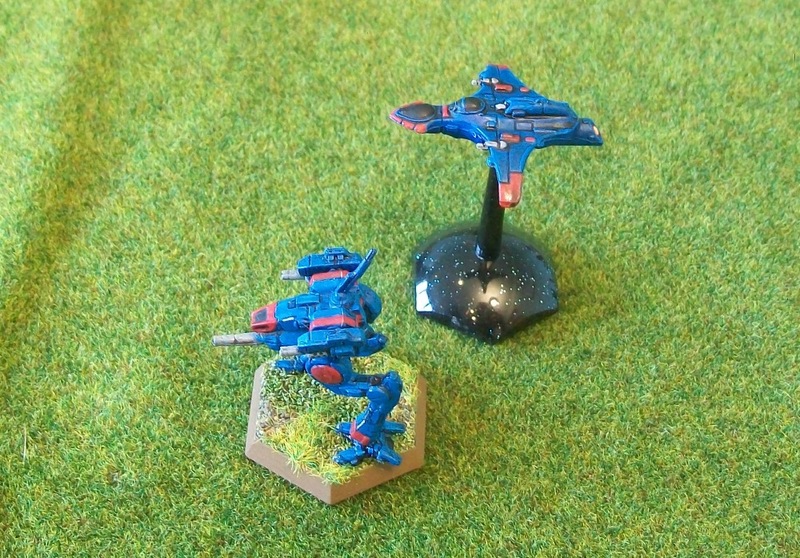 When you are piloting a mech, it is good to know you’ve got support in the skies above! Continuing my slow painting of the new Battletech box set, I recently finished this Thunderbolt. He’ll be joining my ‘Firehawks Legion’ – which for the moment consists of him and the Locust. I don’t have a lot of knowledge about how various mechs compare, but it looks like he’s a good ‘all arounder’ with some pretty heavy armour and a mix of short and long range weapons. Maybe not the most ‘offensive’ of mechs, but one who is going to stay the fight. Once again, I am really pleased with the new mechs. The design looks tough and military in the 1980’s science-fiction kind of way that I find most appealing. I’m somewhat less pleased with my own paint job. It probably needed another coat of blue drybrush over the top to de-emphasis the black wash and to take a little shine off it. Still, it looks good enough for the tabletop, and I can’t be bothered to go back to it when I’ve got so many more figures waiting to get painted! 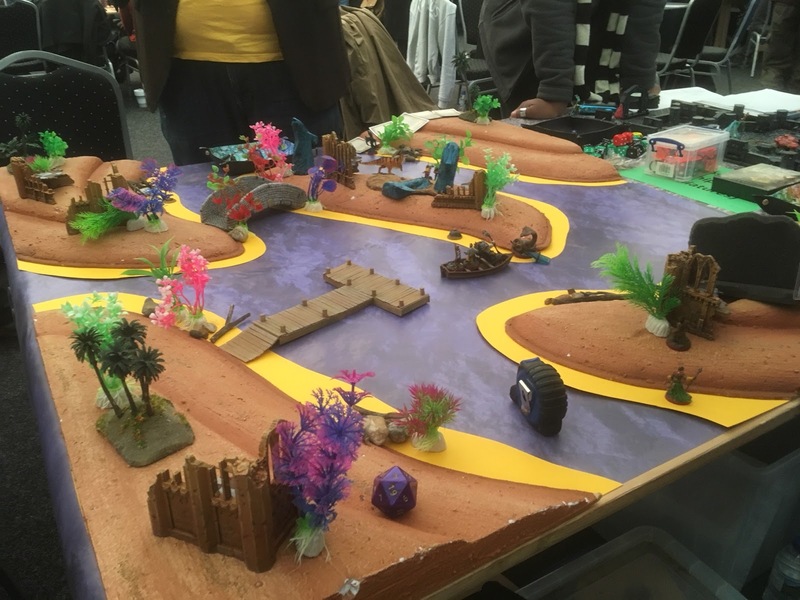 I want to say a big Thank You to the guys from the Hackney Area Tabletop Enthusiasts who came out to Tabletop Gaming Live this weekend and ran demonstration games of Frostgrave and Ghost Archipelago for anyone who was interested. They had a small, dungeon set-up for Frostgrave, and then a bigger (and significantly more colourful!) table for Ghost Archipelago. I’ve chatted with some of them before, when they’ve run demos at Dragonmeet, but it was great to have a chance to really hang out, talk about games and gaming, and meet a bunch of new people. I even signed a few books. I am seriously lucky (and grateful) to have people like this playing my game and encouraging others to play it as well. 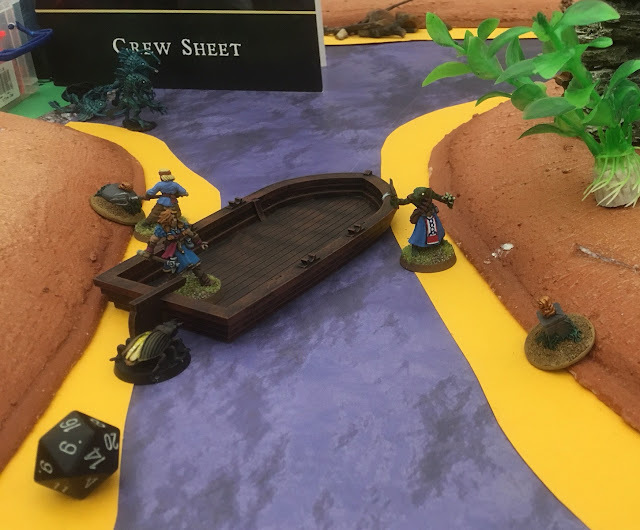 The game opened with Cassandra, her Warden, a scout, and a couple of crewmen jumping in a boat and rowing over to ‘spider island’. Boldly, Cassandra jumped out of the boat and promptly lost a fight to giant spider, took one point of damage, and was poisoned. She had to be rescued by a crewman. So actually, I had a stronger opening than Gary, who quickly lost his Heritor to a giant snake. Things picked up from there. My scout shot down a couple of spiders, and a crewman took out another. Cassandra eventually killed one on her own. Due to the heavy population of snakes and spiders, actual crew-on-crew action was minimal. I did manage to cast warp weapon on Maciek’s Warden and destroy his sword. 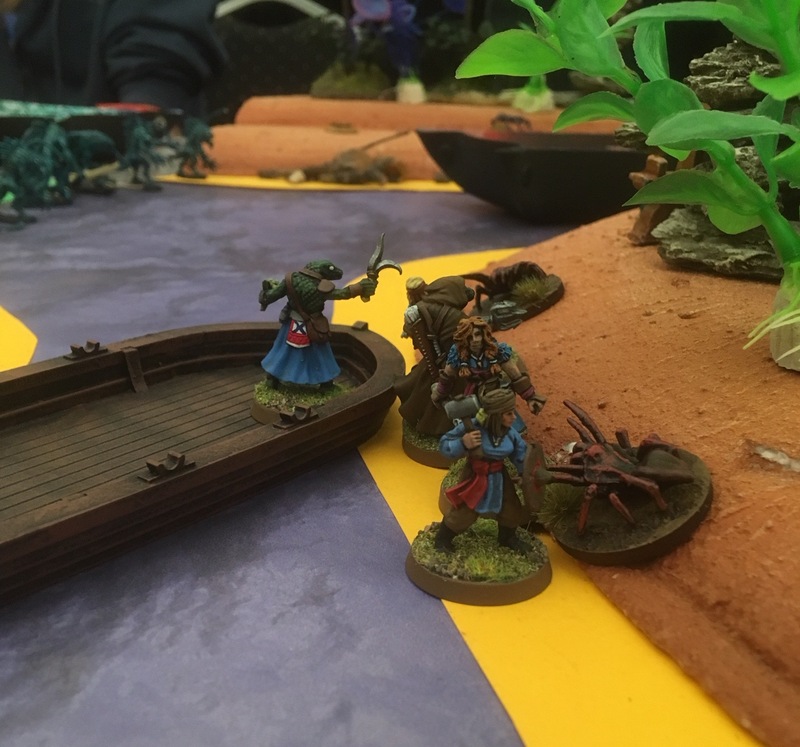 This led to one of the best moments in the game, when his Warden, now unarmed, punched a goliath scorpion in the face, before jumping in a boat to make his get-away. 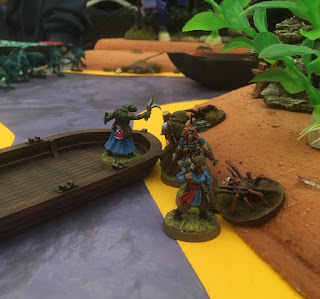 Meanwhile, Gary’s Warden washed away one of my crewman with a well-placed Wrath of the Waves. There are so many spiders lurking just off camera! Eventually, I managed to secure two treasures. Gary had one, while Maciek had one in the bag, with another being carried by a lowly crewman. The crewman had two choices – face the goliath scorpion or jump into the water and try to swim. He opted for later, jumped into the water and promptly drowned as Maciek rolled a 1 for his swimming roll… Victory by default! Now, one may question whether I should count experienced points earned in this very casual pick-up game, but I talked to the designer and he said it was okay. So, Cassandra gained 130xp, while Sliss the Warden got 100xp. I also rolled for treasure and came up with 20gc, a Gemstone of Casting (nice) and a dose of stinkwort. Anyway, once again, thanks to all of the members of the HATE club that came out over the weekend, and an special thanks to Sasha for organizing it! I hope you all enjoyed it as much as I did.